The report finds that the global wellness industry grew 12.8% from 2015-2017, from a $3.7 trillion to a $4.2 trillion market. 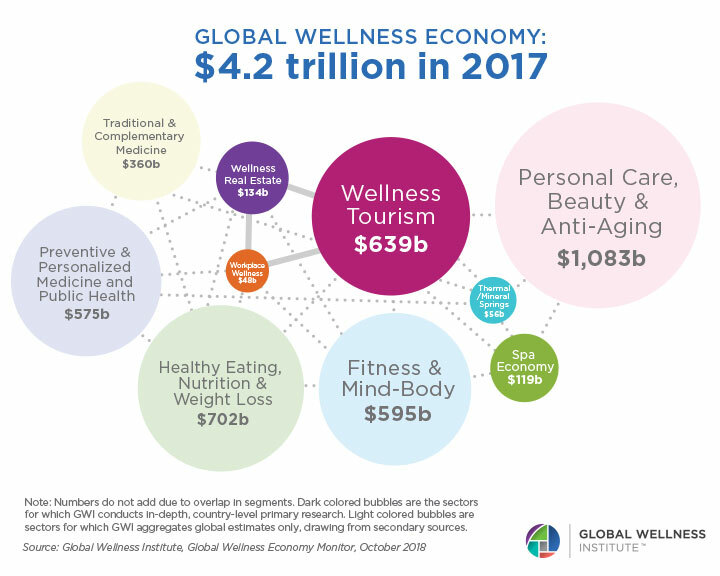 To put that in economic context, from 2015-2017, the wellness economy grew 6.4% annually, nearly twice as fast as global economic growth (3.6%). Wellness expenditures ($4.2 trillion) are now more than half as large as total global health expenditures ($7.3 trillion). And the wellness industry represents 5.3% of global economic output. Read the press release. Real estate that incorporates intentional wellness elements into its design, materials and building – and amenities and programming – is growing fast as more people want to bring more health into the places where they spend the majority of their time. For comparison, this $134 billion market is now about 1.5% of the total annual global construction market and about half the size of the global green building industry. There are now more than 740 wellness real estate and community developments built or in development across 34 countries – a number that grows weekly. Valued at $47.5 billion, the workplace wellness market remains very small in comparison to the massive economic burden and productivity losses (10-15% of global economic output) associated with an unwell, disengaged workforce. Only 9.8% of world employees are covered by a workplace wellness program (321 million people), but heavily concentrated in high-income countries in North America, Western Europe, and Asia. The $639 billion wellness travel market’s annual growth rate of 6.5% from 2015-2017 is more than double the 3.2% growth rate for tourism overall. World travelers made 830 million wellness trips in 2017, 139 million more than in 2015 – and these trips represent 17% of total tourism expenditures. Wellness tourism growth is very much a tale of developing markets, with Asia-Pacific, Latin America-Caribbean, Middle East-North Africa, and Sub-Saharan Africa all clocking robust gains, and accounting for 57% of the increase in wellness trips since 2015. Over the past five years, Asia is the #1 gainer in both wellness tourism trips and revenues (trips grew a whopping 33% in two years, to 258 million annually). China and India rank #1 and #2 for growth worldwide, adding over 12 million and 17 million wellness trips respectively from 2015-2017. The spa economy, which includes spa facility revenues (now $93.6 billion yearly), and also education, consulting, associations, media, and event sectors that enable spa businesses (now $25.2 billion), has grown to a $118.8 billion market. Spa locations jumped from 121,595 in 2015 to over 149,000 in 2017, employing nearly 2.6 million workers. The 9.9% annual revenue growth for spas is much higher than the pace from 2013-2015 (2.3%). From 2015-2017, the hotel/resort spa category added the largest number of spas and revenue, and has now surpassed day/salon spas as the industry revenue leader. The thermal/mineral springs market continues to clock strong growth as more people turn to water for stress-relief, healing and community. The market grew from $51 billion in 2015 to $56.2 billion in 2017, while facilities jumped from 27,507 (in 109 countries) to 34,057 (in 127 countries) – employing 1.8 million workers. The industry is intensely concentrated in Asia-Pacific and Europe, which account for 95% of revenues.